Are employee turnover and ergonomic issues in your polyiso insulating board product manufacturing and packaging lines causing you concerns? Motion Controls Robotics is the leading expert in robotic polyiso board handling with the largest installed base of systems throughout the country. 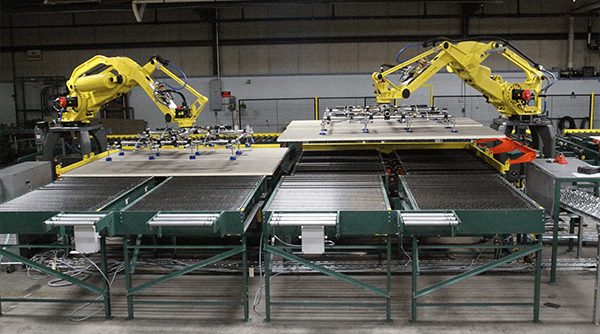 We have developed a pre-engineered robotic polyiso board handling system to minimize production and packaging costs and improve quality for the manufacturers of building products. This robotic board handling system reduces production costs, eliminates ergonomic issues and allows for on-the-fly process adjustments. This proven system is also easy to use and install. Other large flat building products such as drywall, paneling, sheetrock, plywood, and other specialty building products can also be robotically palletized handled with the system. Read testimonials to see how this automation system has helped other manufacturers.